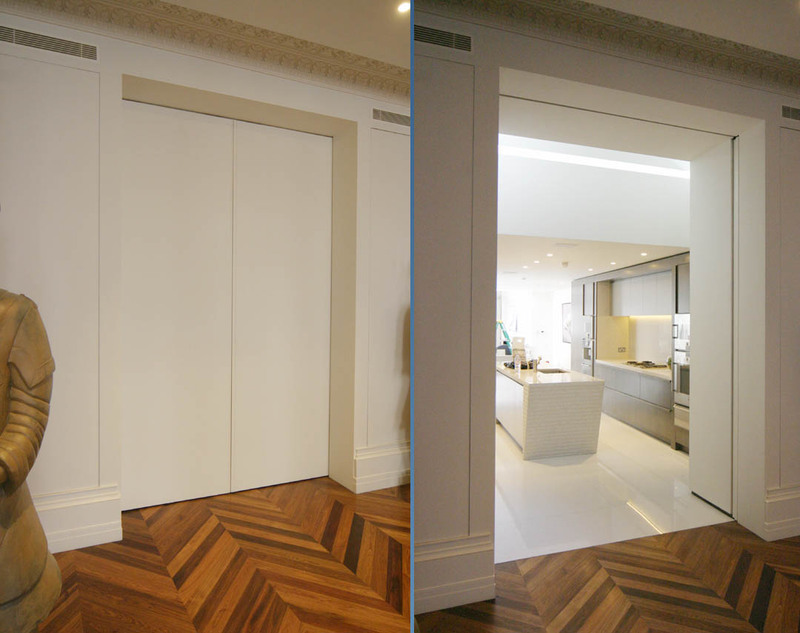 meia created these retractable automated sliding walls that retract two moving elements into discreet slots. They allow the rooms to separate or merge at will, opening or closing in just ten seconds. The movement is quiet and smooth, with safety torque sensing eliminating risk of people or objects being trapped. The key feature of these walls is that they operate without the need for tracks on the floor. Despite their large size and weight of 450kg, they allow an uninterrupted walking surface. Such walls can be clad in any finish to match the décor, from painted finishes to marble, glass, or metal. Due to the high door weights we also supply a fully bespoke heavy duty hidden track/carriage/drive system in the ceiling. The system can be manually moved in the event of emergencies or power failures. Additional backup battery powered operation is also available. As this moving wall operates with a closing joint of just 2mm we use particularly rigid framing techniques to ensure a perfectly accurate installation. This also prevents the frame being warped by the cladding, whether heavy or light, and likewise if it is different on one face to the other. Getting such large frames into a house in one piece is a challenge, but nothing that can’t be solved by careful planning and the right equipment.